The Daytona 500 is NASCAR's Super Bowl and one of the most watched motorsports events of the year. And thanks to a combination of Saturday's huge crash and Danicamania, Sunday's race was the most watched Daytona 500 in seven years. Daytona pulled in an overnight rating of 10.0 with a 22 share. 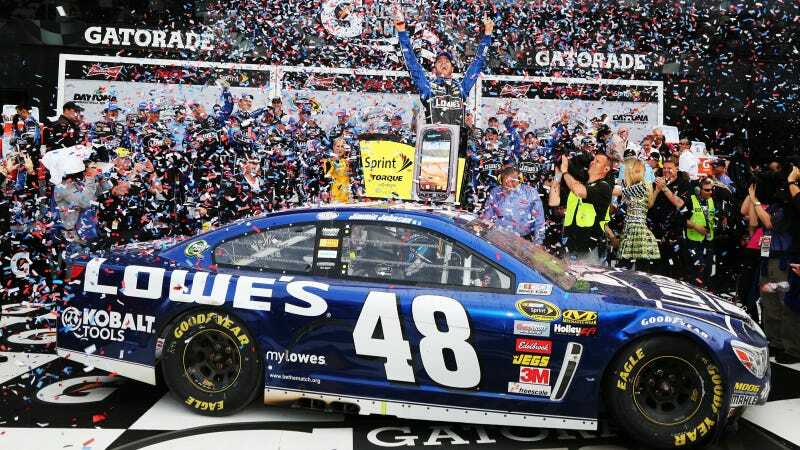 That's 30 percent more than last year and the best since 2006, which was also won by Jimmie Johnson. What does a 22 share actually mean? It means that 22 percent of TVs that were on during the race yesterday were tuned to the Daytona 500. That's huge. Last year's rain delayed Monday night race debacle scored a 13 share, even with a gigantic fire from Juan Montoya crashing into a jet dryer. I believe the gain can be attributed to two factors. First is Saturday's terrible crash in the Nationwide race that injured 30+ fans. You couldn't turn to any channel without seeing a replay of it. That put the Daytona 500 on the radar of pretty much everyone that owns a TV. Secondly, we have the Danica Patrick bump, aka Danicamania. Love her or hate her, she brings publicity wherever she goes. In 2005, Danica qualified fourth for the Indy 500 and brought more attention than the race has seen in years. As a result, Indy's ratings were up a staggering 40 percent compared to 2004. She also completely overshadowed winner Dan Wheldon in national news coverage. This year we had Danica starting first for the race and she ran in the top 10 all day. That's more than enough to keep casual or non-fans tuned in. I doubt the bump in ratings will continue for the whole season or even for the next race. This was a perfect storm of publicity that doesn't come very often.